I live in Portland, Oregon but was recently up in Seattle when I spotted this. Yes, they’re probably riding the coattails of Starbucks’ Italian Roast but who cares? It’s still a neat looking card. 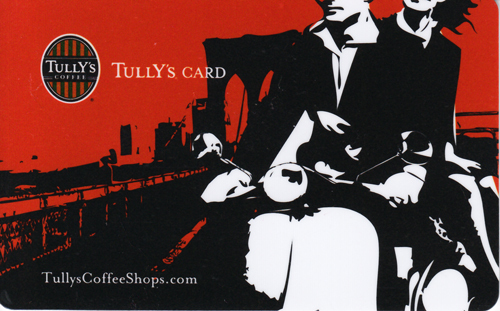 Alas, Tully’s is only located in Seattle. But hey, isn’t that the Brooklyn Bridge behind the riders? Why not the Space Needle?? This entry was posted in Food, Wine, Miscellaneous and tagged gift card, scooter, seattle, tully's coffee, vespa by Tracy. Bookmark the permalink.